This month we start a new feature called “Beneficial of the Month” , featuring insects that can help keep damaging pest insects under control. Sadly, these insects are often misidentified and mistaken for pests. There are some 7,000 species of assassin bugs the world over, and each is equipped with nasty, highly hardened mouth parts called a rostrum. 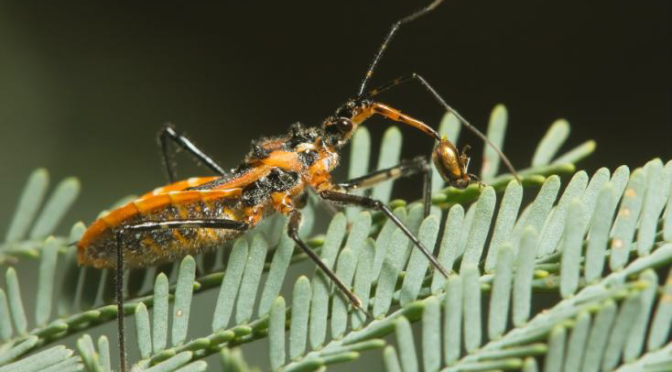 With this the assassin bug stabs through the exoskeleton of its prey—ants and termites and bees and such. An outer sheath peels back once inside to expose the maxillae (mouthparts used for chewing) and mandibles, according to biologist Christiane Weirauch of the University of California, Riverside. Caution: According to Galveston County Master Gardeners, although most assassin bugs are slow-moving and non-aggressive, they will use their rostrum in self-defense if handled carelessly. Such bites may be rather painful to humans be-cause the bugs inject the same salivary secretion used to dis-solve the tissues of their prey. This results in the death of a small area of cells at the site of the bite. The symptoms are an intense burning sensation, of-ten followed by a small, itchy lump that may persist for several days. However, no true toxin is involved so it is rare for the reaction to last long or to extend beyond the site of the bite. Some bites occur when the bugs are purposely handled out of curiosity, but most hap-pen through accidental contact while gardening or working in the open. The sharp pain associated with assassin bug bites is usually enhanced by the surprise accompanying the experience.